Vasco da Gama was supposed to have made his agenda clear to the first person he had met on Calicut coast. The story goes that in reply to a question from the Genoese trader (who was the first person encountered by da Gama), why in the name of the Devil had he come here, da Gama calmly replied: ‘For Pepper and Christ’. Obviously he wanted to please both his masters – Prince Manuel I of Portugal and the Pope who had blessed the voyage and whom Manuel I wanted to placate. Pepper indeed formed the main item of export from the Malabar Coast, but as the Portuguese established themselves in Goa and Cochin, the trade also got complex. During the initial days of conquest, there was a virtual state monopoly imposed by the Portuguese on Malabar spices and this meant that ship after Portuguese ship would be loaded with pepper and other spices and would sail from the western coast of India, escorted by the powerful armada. But, as Portuguese trade stabilized, private players also got involved which included non-Portuguese players as well. 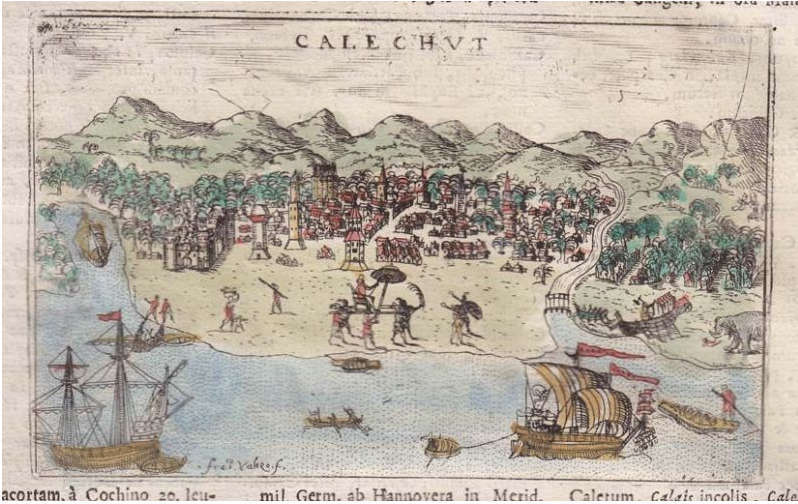 The Venetians, who had been uprooted from their monopoly of the Mediterranean trade soon after Vasco da Gama had discovered the Calicut route, did not waste time to capitalize on the new opportunity. Frederick set out on his long and eventful voyage in 1563 from Venice, travels to Cyprus and finally lands up in Portuguese Goa in 1566. He proceeds from Goa to Malacca in a Portuguese ship which was en route to Banda to pick up a cargo of nutmegs and mace. The ship passed through Ceylon and Nicobar before reaching Pegu in present day Myanmar. His description of the cannibal tribes of Andamans is graphic. After selling his cargo of nutmeg and sandal, he decides to proceed to Venice via Chittagong, Cochin and Lisbon. But a severe cyclone (touffon) hits the ship which drifts to the Sondiva (Sunderbans) islands. He eventually makes it to Cochin only to realize that the Portuguese vessels had all departed and he would have to wait for a year to catch the next sailing. He decides to proceed to Goa for the wait and to transact some business. Frederici falls ill in Goa and has to sell some of his rubies (which he had purchased from Pegu) to meet his medical expenses. He had, however, taken care not to sell the most valuable rubies which he preserved for sale back home in Venice. Once he recovers from the illness, he decides to proceed to Cambay where he invests a large sum (2100 ducats, to be precise) in buying opium which fetched a good price in Burma. He again travels east via Cochin and reaches Pegu only to realize that just a day before his cargo had landed, a large shipload of opium from Cambay had arrived crashing the price of his commodity from 50 to 2½ Bize. On an investment of 2100 ducats he could recover only 1000 ducats after two years! Such was the uncertainty of coastal trading in those days. We have another account of a private trader, more than a hundred years after Frederici which gives a fascinating account of the diversity of coastal trade. Charles Lockyer, an English trader boarded the East India Compay ship Streetham in February 1703 and reached Batavia in October of the same year. As the monsoon winds had changed, he could not proceed to China which was his ultimate destination and used the interval by trading between Malacca and India. The ship managed to sell its cargo in China only in September 1704 with the resumption of favourable winds. 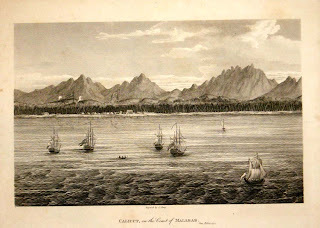 On the way back the ship, laden with goods originating in China, Malacca and the eastern coast of India reached Calicut by which time again the season for sailing westward had ended. So the ship shuttles between Colombo and Surat in the north, hugging the coast to avoid the rough seas and making good money selling various surplus European goods and buying Indian spices for the return cargo. 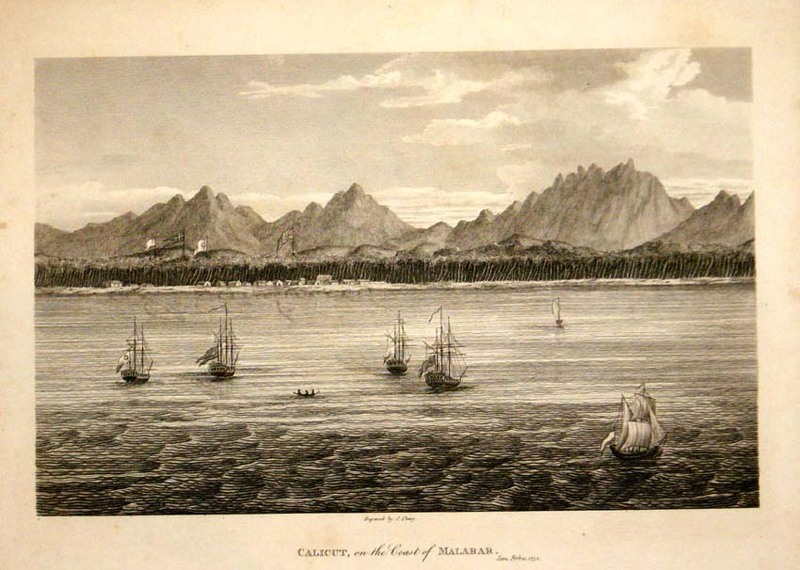 The chief items bought by the ship are Cardamom and Coconut kernels at Calicut, coir, hubble-bubble cane (for making the hooka) from Maldives, cardamom and rice from Tellicherry, arrack from Goa (one of the most lucrative trade for, according to Lockyer, it was available for Rs. 13½ per hogshead in Goa and could fetch Rs.25-30 in Bombay and Surat.) He was prudent enough to mention: the smuggling trade with the Dutch, I leave to the Persons concerned – emphasizing that he indulged in only legal trade! Lockyer’s description of Tellicherry (which had just acquired the status of a fort) is interesting. Among the important items mentioned by him is opium ‘of a deep purple, the best in India’, ‘…it bears double the price of Bengal opium’. He next lands in Calicut and after a pleasant stay moves down to Cochin, then a Dutch stronghold. The ship is replenished with essential supply in Cochin – 60 pigs, a thousand fowls, one small heifer (‘but beef is not usually so cheap’) and water casks. The ship then proceeds to Europe, crossing the Cape of Good Hope in July 1706. This was an era of ‘pure trade’ when the Europeans were contended with making money out of trade and had no territorial ambitions. Trade was not conducted only by the East India Company, but by small enterprising traders who saw opportunities in a delayed sailing and pursued profitable coastal trade between Malacca and Malabar and Malabar and Hormuz. They competed with the Arab, Moplah and Chetty traders . Some like Frederici lost hugely and others like Lockyer made windfall profits! one of the best stories of of a trader and his problems in malabar would I guess be Ibn Battuta's.. watching the ships get trashed by waves,losing his life's savings.. Thanks, Maddy. I agree no one to beat IB in terms of getting into trouble. But, he was not strictly a 'trader', having been a magistrate in Delhi and much more in Maldives! I had focused on itinerant traders of the post-Gama era, like Frederici (agreed Lockyer was not strictly of that group, but was a private trader like most of the EIC servants). As for IB's experience in Calicut, one cant judge which must have been more painful to him when waves destroyed his ship - the loss of his savings or of the beautiful slave girls he had planned to carry on his journey to China. I happened to visit Kappad after 2 years and once again searched for the stone monument which commemorates the landing of VdG at Kappakadav in 1498. Can someone enlighten by whom and when was this monument built? It was sad to note that though the Department of Tourism spent around 1.5 crores beautifying the beach, the monument was moss ridden and the surroundings least bit adding to the importance of the event. Probably the authorities felt that it had nothing to do with the beach. Wikipedia quoting LOGAN'S 'Malabar Manual' says that ‘actually Gama landed at port of Panthalayani, that is some 6 km away from Kappad’. Can someone enlighten me on this fact; can this locality be approached by road now? And, the pathways made by piling stones into sea has robbed the original charm of Kappad. Thank you Devasahayam for the comments. The stone is still there in Kappad, in an inconspicuous corner before one reaches the tourist area.Logan was right as per our information.